The Red Bull Soapbox Race is a global series of events that pit amateur drivers racing in homemade soapbox cars against each other in a battle not just for speed but for most innovative design. This unique non-motorized racing event challenges both experienced racers and amateurs alike to design and build outrageous, human-powered soapbox dream machines and compete against the clock in a downhill race. The rules are quite simple: all crafts must be human-powered, meaning no engines, pedals or external energy sources; the machine cannot exceed a maximum of six feet wide, 12 feet long, be at least seven inches from the ground and can’t be taller than seven feet; must have fully functioning brakes and steering; and it can’t weigh more than 176 pounds. Easy, right? Well, add in some crazy obstacles, like jumps, stairs, and bowl turns, to the course you’re trying to barrel down at break-neck speed and things can get interesting. One of the teams (shown in image above) competing in the Red Bull Soapbox event in Valkenburg, The Netherlands, on August 19th is a team sponsored by SOLIDWORKS value-added reseller CAD2M. 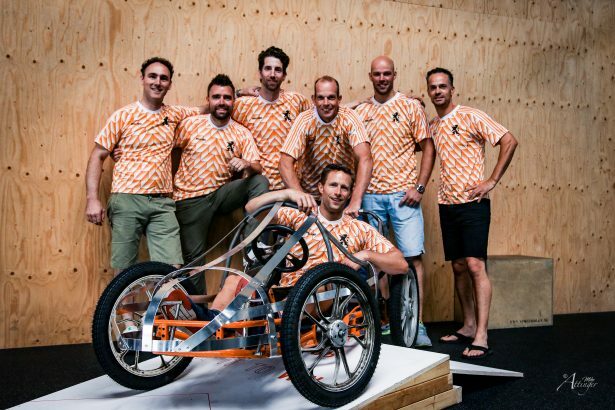 The team includes an interesting assortment of men from various backgrounds, including a retired semi-professional dirt bike racer who will drive the car, four mechanics three of whom work in the automotive industry and one who is a skilled carpenter, and Teun Willems, the marketing manager at CAD2M. Will SOLIDWORKS be the team’s secret to success? 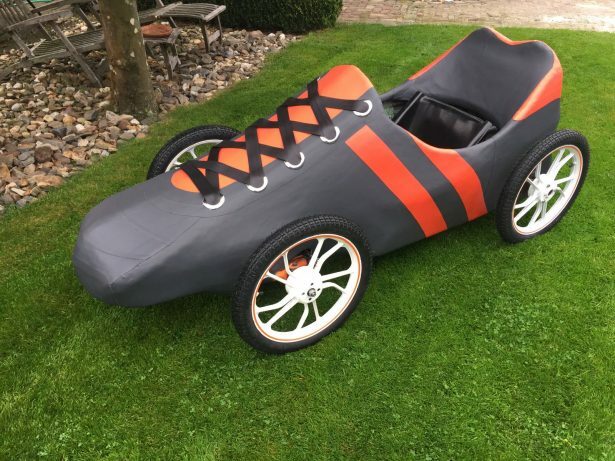 The team decided to build an 1988 soccer shoe to race. You can help out the team by voting for them here, which the jury will take into account to determine their overall ranking. 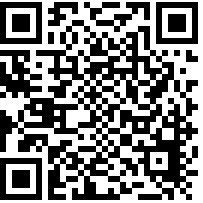 Look for the “Vote Now” button.